Gupa is currently wrapping up a year of research on the ground—and on the seas—in his native Philippines, which is partially supported through a 2017 CAPI Student Research Fellowship. “I have been here in the Philippines for my field work since September 2017. My site is located in Samar-Leyte Region and I am working with local elders in the island community of Guiuan, where the deadliest typhoon of 2013—Haiyan Typhoon—entered,” he writes. 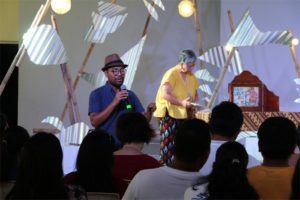 Held in May 2018, Gupa’s Paddling Visions sought to expand dialogue on climate justice in the Philippines. “This event is one of the activities that executes and explores my methodologies—participatory/community action research and applied theatre as research,” he writes. 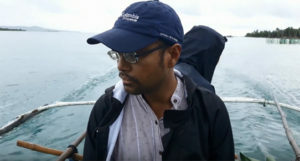 “My heart overflows with gratitude for the participation extended by the communities in engaging them in grounding stories on the impact of climate change,” he says, noting the widespread participation in his research from all walks of life—including elders, women, children, fishermen, government officials, teachers, artists, scholars and others. Gupa is working with Theatre professors Kirsten Sadeghi-Yetka and Warwick Dobson. After receiving a scholarship from the Indonesian Ministry of Education and Culture to study contemporary theatre and traditional mask dance at Bandung’s Sekolah Tinggi Seni Indonesia, the Asian Cultural Council’s awarded Gupa a fellowship to undertake a director-in-residence program in New York City, where he participated in and observed contemporary theatre directing process with Ma-Yi Theatre Company, National Asian American Theatre Company and the Juilliard Drama School. In addition to an MFA in Directing from UBC and a Theatre MA from the University of the Philippines, Gupa was also awarded the 2016 Performance Studies international Dwight Conquergood Award and the $10,000 Ada Slaight Drama in Education Award in 2017.